ARTery received generous support from Opus Art Supplies this past month which permitted us to purchase more materials for participants in our programs. 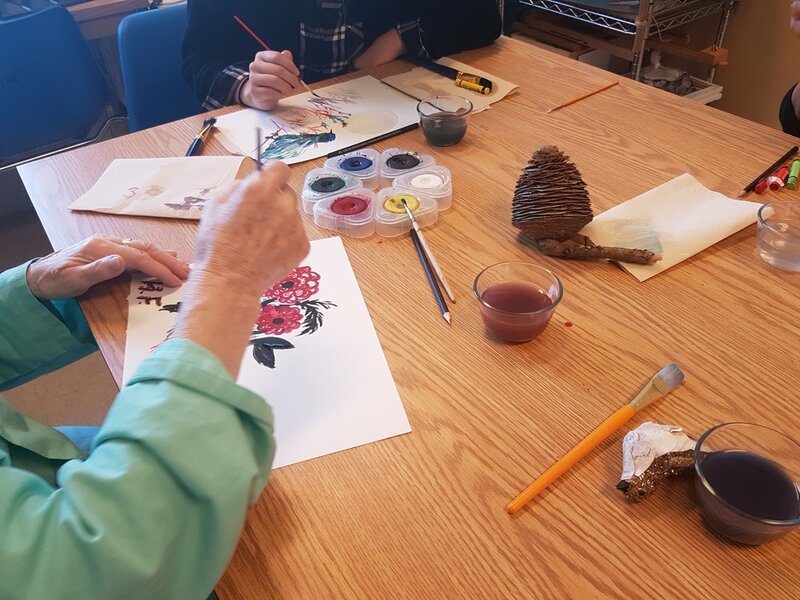 When working with our participants, our focus is on the artistic process rather than the final product, yet time and time again, participants are creating beautiful works of art as a result of their experience with ARTery. Collaboration is at the heart of ARTery, and is core to all we do. Our programs take time to develop as we create them in consultation with the clinical team in any given location and we are responsive to the unique needs of each participants. Our team of artists are selected to suit the venue and population with whom we work. In October, ARTery began three new programs on the North Shore thanks to the generous support of Lions Gate Hospital Foundation. In October, after over a year of planning, we began a weekly open art studio for youth at the Carlile Youth Concurrent Disorder Centre. We have begun to set up the art studio thanks to the generous support of Opus Art Supplies, who provided us with a large discount to purchase supplies for the youth attending this new facility. So far youth have deconstructed books, and created acrylic paintings on handmade paper. Once a week, we run a group arts program for people attending the day program. The program is in its infancy and will be further developed to meet the needs and interests of the participants. Facilitating an art program for people with a range of abilities, and some of whom have a dementia disease, can be challenging. Each person who attends has a unique approach to their painting time and we seek to work one-on-one to fully engage them. The space within this facility is very small, and set up and clean up has to be done quickly so, with the help of the staff, we rapidly clear away dishes, and set up watercolour paints, paper and brushes. This exciting visual arts program is driven by the skills and interests of those attending the day program: some of whom have never painted before. On this unit we are mobile, moving the art cart to each person in order to offer an opportunity to anyone who would like to participate. Some patients choose paint, others learn to knit while some draw or work with clay. The program is open-ended and those attending their dialysis say that they look forward to working on their projects. We are grateful to the BC Renal Agency for their generous support of this program over the past two years. When I was growing up and making art, I was always saying: "I'm not good at that.”, "She is better at this than I am.” , ”I wish I knew how to draw.” Now, when I run arts programs with patients in hospitals or in communities, I hear people say this to me, especially when they are painting, or sculpting or drawing. As facilitators it is so important to set up an environment that encourages people to take chances: those negative thoughts can be destructive and can limit the risks we take, in both the way we live our lives and in the activities we choose to undertake. Research has shown, that participating in an art program can have a positive effect on one’s sense of well-being, reduce anxiety and stress, and distract people from their illness. Creativity and participation in art can reawaken a sense of identity, dignity, and re-engagement among people with dementia. There is growing evidence by leading neurologists and researchers that shows how parts of the creative brain can be spared, and the great benefits of art approaches. It is important that, as facilitators, we set up a failure free environment: encouraging, redirecting if necessary, but never disparaging those who participate. In a recent project at an acute hospital, I ran weekly arts activities for those with dementia and Alzheimer’s Disease. One patient, who had severe psychological and behavioural symptoms of dementia was able to engage with the art process and sustain her attention to painting for over an hour: she smiled and laughed during social conversations. She was a skilled painter and when those around her spoke about their self-perceptions about their own creative inability, she found herself encouraging others. The art provided her a way to express herself, which helped others to see her strength, talent and beauty, rather than someone with dementia. Lael Williams, one of our Founding Directors, has moved to Toronto to take up a new position with Canada Goose. While she is physically located across the country, she continues to support our programs and offer her wisdom and advice. We congratulate her on the move, and are happy she continues to actively contribute to our organization. A few months ago, we were approached by Canada Helps to submit some images of art done by our program participants for the organization to pass around at trade shows.. A work of art created by one of our participants, Rebecca Gingall, has been selected from many submissions from our society and other not for profits. Congratulations Rebecca! We are so grateful for the support of our community partners and private donors. Your contributions are needed to sustain our programs and are greatly appreciated. Although at this point ARTery Arts and Health Society cannot provide tax receipts, we partner with Foundations and other Organizations who can offer donation receipts. Please call Sarah Dobbs at 604 355 0561 to discuss.